Son Chhay has been a fixture in Cambodian politics since 1993. A member of the now-dissolved opposition Cambodia National Rescue Party (CNRP), he opted to remain when other party leaders fled the country. Phnom Penh, Cambodia Son Chhay is still smiling. 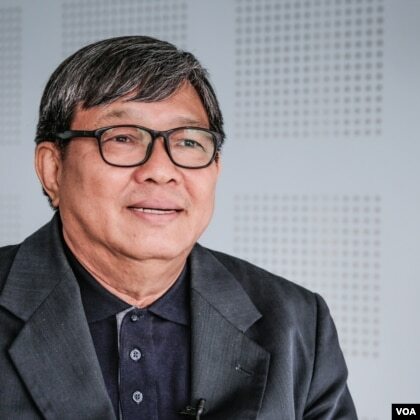 Despite the political trials he and his colleagues in the banned Cambodia National Rescue Party (CNRP) have faced, the veteran politician remains upbeat about democracy in Cambodia as he speaks with VOA Khmer in an exclusive interview ahead of July’s general election. The CNRP, a party in which he formed a central pillar since its founding in 2012 in a merger between the Sam Rainsy Party (SRP) and Human Rights Party, was dissolved in a controversial court decision in November. More than 100 of its officials were banned from politics for five years and most of its leadership have fled the country, fearing reprisals. But amid the chaos, threats and departures of his colleagues, Chhay has stayed put. Chhay has been a fixture of Cambodian politics since 1993, standing for several parties, including the Buddhist Liberal Democratic Party (BDLP) and the SRP. A diligent investigator, he could often be found in his parliamentary office meeting sources or poring over documents. Since the CNRP won a large minority in the 2013 election, Chhay served as the party’s chief whip. Chhay was one of 118 CNRP officials who were banned from politics until 2022, when Dith Munty, the country’s top judge and a senior ruling Cambodian People’s Party (CPP) member, ruled on November 16 that the party should be dissolved for alleged collusion with the United States to topple Prime Minister Hun Sen. The party’s leader, Kem Sokha, was jailed on treason charges, which have roundly been denied by the opposition. The party’s dissolution was seen as the “death of democracy” in Cambodia by some, whereas the government claimed it was only following legal procedure. 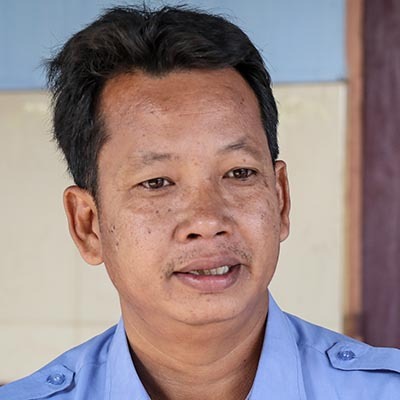 Chhay said the loss of his job and his decision to stay in Cambodia when many of his colleagues fled has given him a lot of time for reflection. “For 20 years I did my job with sincerity and honor,” he added. Chhay now spends hours browsing through archives of documents he has collected over some 25 years. He said he wants to write a memoir and has been reading biographies of world leaders, including Chinese reformist leader Deng Xiaoping. “I like that he thought a lot and spoke less. But he’s not my role model; I just like that idea,” he added. Chhay was born in Siem Reap province in Cambodia’s north, a stone’s throw from the world-famous Angkor Archaeological Park. His father worked at a state-owned transportation company while his mother stayed at home to look after Chhay and his 11 siblings. After finishing school in the 1960s, Chhay worked for a while in radio, learning the ins and outs of political debate during the reign of the late King Norodom Sihanouk. This period, he says, gave him a taste for political life, but it was not until the Khmer Rouge regime fell in 1979 and after the death of his father and two siblings that he decided he wanted to enter politics full time. “My biggest driver was the Khmer Rouge regime. I had a feeling that Cambodia was always ruled by irresponsible leaders, causing difficulties for the people. From one regime to another, leaders only cared about their own power and image,” he said. Throughout the 1980s he spent time as a refugee in Australia, where he learned and later taught mathematics before returning to Cambodia in 1991 as a teacher trainer. Soon after his return, in 1993 he joined the BDLP with the U.N.-sponsored election just around the corner. He was elected as an MP in Siem Reap province. In July 1997, forces loyal to Prime Minister Hun Sen staged a coup against Prince Norodom Ranariddh, then serving as co-prime minister. 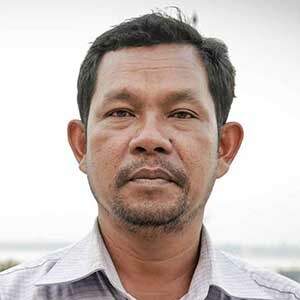 Chhay, then a BLDP lawmaker, attempted to broker peace between the warring factions. Chhay arrived in Phnom Penh from Bangkok and presented Hun Sen with a peace roadmap. He managed to gain an audience with King Sihanouk, where he pitched his vision for national reconciliation. “His majesty was crying during our talk. It was just the two of us… . This was the most memorable event in my life,” Chhay says. Several months later, a breakthrough in the standoff came, paving the way for elections in 1998. Chhay soon joined Rainsy’s eponymous party. While many of his colleagues believe the only way forward in Cambodia is to bring international pressure on the Hun Sen regime, Chhay said he thinks a combination of local campaigning and lobbying foreign governments can work. In 2012, in a rambling five-hour address to parliament, Prime Minister Hun Sen accused Chhay of being a spy and working behind the scenes to cause instability in Cambodia over the Vietnam border demarcation issue, a sore point. Chhay said it was “painful” to be accused of espionage, adding that though he may be able to broker talks with Hun Sen to this day, he fears being recorded and later exposed in pro-government media outlets. After the 2013 election, which was widely seen as not free and fair by the independent electoral watchdog COMFREL (PDF) and Human Rights Watch, the CNRP took to the streets in the tens of thousands to protest the results. Chhay said he was not a big supporter of the decision to stage mass protests, gatherings which lie at the heart of ruling party allegations of a conspiracy to overthrow Hun Sen.
A failure to build trust between the leaders of the two parties contributed to the collapse of a short-lived bipartisan political détente and a later deterioration in relations that led to the banning of the CNRP, he said. “A peaceful transfer of power needs time, mutual trust and assurances,” he added. Chhay saw himself as a “principled” voice of opposition within the CNRP. He admires the sacrifices both Sokha and Rainsy have made for the country. But now Chhay, along with his former leaders and colleagues, have been labeled “traitors” and “urban rebels” by a pliant pro-government media. He does not think such language is helpful in the quest for national unity, complaining that he has lost touch with friends who fear being tarred with the same brush. “I do hope the Royal Government will not continue to label us like this,” he said. The United States says it will take further action against the government of Cambodia following a landslide victory for the ruling party. The European Union, Canada and Australia also condemn the election. Cambodians head to the polls for an election from which the government has banned the only viable opposition party. The Cambodian government orders internet service providers (ISPs) to block the websites of 15 news websites of independent outlets including Voice of America for two days before and during the country’s election. Five former CNRP officials in Battambang province are found guilty of obstructing the vote and fined $2,500 each over a Facebook post supporting an election boycott campaign. Cambodian political parties wind up their campaigning ahead of a general election expected to be an easy victory for the ruling party. U.S. House of Representatives passes the Cambodia Democracy Act, paving the way for sanctions to be imposed against members of Prime Minister Hun Sen’s inner circle. Japan says it won't send election monitors to Cambodia for the July 29 vote even though Tokyo, a major donor to the Southeast Asian nation, has sent observers to many previous elections. The government orders fines or even the arrest of people who uploads images on social media as part of an opposition-organized campaign to boycott the vote. Cyberattackers are caught hacking key Cambodian government institutions in what is strongly believed to be a coordinated Chinese government assault ahead of the July 29 national elections, according to an investigation by FireEye, a U.S. cybersecurity firm. Electioneering kicks off for the July 29 national elections. Twenty political parties are registered to participate. Cambodia’s National Election Committee (NEC) says 50,000 observers -- some from China, Myanmar and Singapore -- will monitor July 29 election. United States imposes sanctions on Hing Bun Heang, the head of Hun Sen’s bodyguards, citing human rights abuses. The government issues an order that it will work with telecommunication firms to monitor and control online news deemed to cause “instability,” as part of the government’s crackdown ahead of July 29 election. Cambodia's National Election Committee (NEC) issues a controversial code of conduct for journalists covering the July 29 election. It includes a ban on asking detailed questions about results. Despite dissolution of CNRP, 20 political parties, including the ruling CPP, register to participate in July 29 election. The respected Committee for Free and Fair Elections in Cambodia (Comfrel) says it will not observe and monitor the July election, citing the Cambodian government’s accusation against the group and other organizations in promoting a “color revolution” in Cambodia. The country’s last remaining independent English-language newspaper, the Phnom Penh Post, is sold to a Malaysian investor whose company has links to Hun Sen.
Former CNRP leader Sam Rainsy calls on his supporters and voters to boycott the July election. Former CNRP president Sam Rainsy launches the Cambodia National Rescue Movement (CNRM), which he envisions as keeping the CNRP “alive” from abroad. He says it “cannot be dissolved” because it is not registered with the government in Cambodia. Sam Rainsy said the movement's plan includes ensuring free and fair elections in Cambodia in July. The Supreme Court dissolves the CNRP, a move that causes some opposition members to join Hun Sen's ruling CPP, while opposition leaders flee the country or are forced out of politics. Opposition lawmaker Mu Sochua flees Cambodia after Prime Minister Hun Sen threatens to arrest opposition politicians in the wake of Kem Sokha's arrest in September. Radio Free Asia ceases operations in Cambodia after nearly 20 years, citing the government’s crackdown on media. Dozens of radio affiliates in Cambodia that sold airtime to RFA and VOA are shut down, with the government citing licensing issues. Other remaining licensed radio affiliates stop broadcasting RFA and VOA content. The independent Cambodia Daily newspaper announces it will cease operations in Cambodia after 24 years when it is slapped with a $6.3 million tax bill, which its publishers said was politically motivated and impossible to pay. Opposition leader Kem Sokha is arrested at his Phnom Penh home for alleged treason. 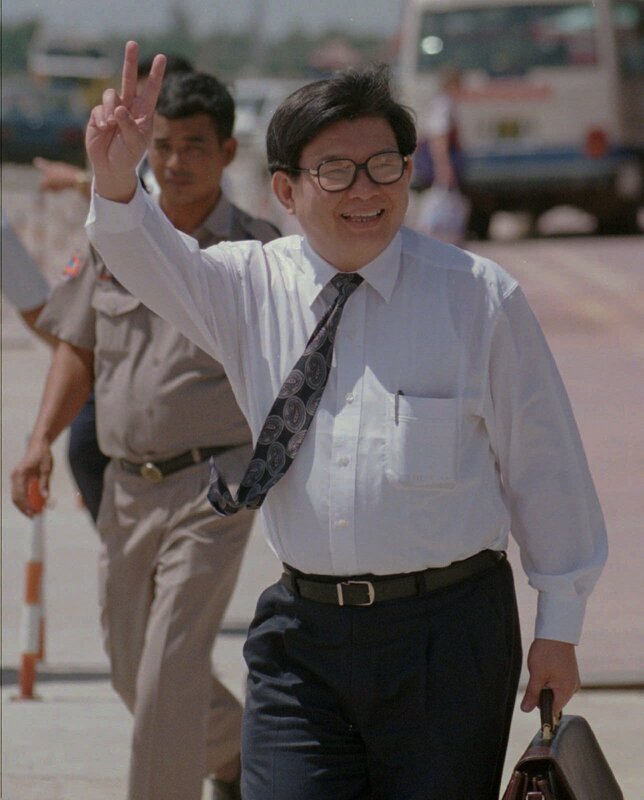 The government accuses him of conspiring with the U.S. to bring down the Cambodian government. Prime Minister Hun Sen warns the CNRP not to defend Kem Sokha at the risk of being dissolved. The Cambodian government forces the U.S.-funded National Democratic Institute to halt its operations in Cambodia, saying the group is not legally registered. The National Assembly passes bill barring political parties from having any formal affiliation with convicted criminals. The CPP wins the majority of seats, but loses ground to the CNRP. Kem Sokha succeeds Sam Rainsy as the CNRP president. Sam Rainsy, the self-exiled leader of the CNRP, resigns in an attempt to save the party from dissolution after Prime Minister Hun Sen threatens to change the law to enable the government to dissolve parties with officials who have committed criminal offenses. King Norodom Sihamoni pardons Kem Sokha, as requested by Prime Minister Hun Sen.
Phnom Penh Municipal Court sentences Kem Sokha to five months in prison over a case involving prostitution charges that are believed to be politically motivated. Kem Sokha does not appear in court. Kem Ley, a well-known political activist and government critic, is shot dead in broad daylight at a petrol station in central Phnom Penh, in what police say is a personal dispute over money, a claim his wife denies. Kem Sokha goes into hiding at the CNRP headquarters to avoid arrest after being accused of procuring a prostitute. Four officials with the human rights group Adhoc, as well as the deputy secretary-general of the National Election Committee, are arrested for involvement with the alleged prostitution case against Kem Sokha. The government strips Sam Rainsy of his lawmaker status and immunity while the opposition leader is traveling outside Cambodia. The move paves the way for arresting him in connection with a defamation case. Pro-government mob beats two CNRP lawmakers in front of the National Assembly; the mob demands that National Assembly Vice President Kem Sokha step down. Cambodia's National Assembly approves a controversial law that critics say gives authorities sweeping power to crack down on civil society groups challenging the government. An overhauled National Election Committee, created by bipartisan agreement, moves to spearhead electoral reform. The CNRP strikes deal with Prime Minister Hun Sen, ending yearlong boycott of parliament. The Cambodian government charges six opposition politicians with leading an “insurrection” after a clash with security forces that prevented opposition supporters from rallying in a public park. Military police crack down on CNRP and garment worker protest, ending months of street demonstrations that leave at least four people dead. The CNRP and its supporters hold mass protests in Phnom Penh over the contested election results, calling for Hun Sen’s resignation and an election restaging. Cambodia holds its fifth national elections, and the opposition CNRP wins 55 of 123 seats in the National Assembly. The CPP wins the remaining 68 seats. 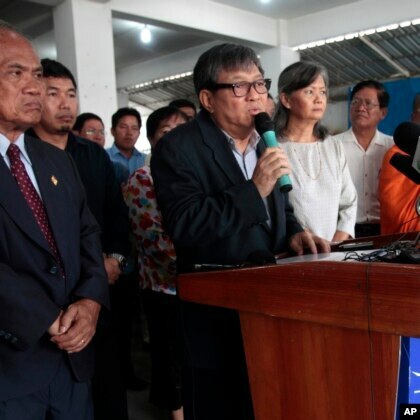 The CNRP rejects the results and launches a high-profile boycott of parliament. After King Norodom Sihamoni pardons Sam Rainsy at Hun Sen’s request, the opposition leader returns to Cambodia days before the national elections. King Norodom Sihanouk dies of a heart attack. He was 89 years old, and had spent most of his time after abdicating in 2004 outside Cambodia, favoring Beijing and Pyongyang. Top officials from the SRP and HRP meet in Manila to finalize their merger into a new party: the Cambodia National Rescue Party (CNRP). Cambodia holds third commune elections and the CPP wins 61.8 percent of communes. Sam Rainsy flees the country again, facing charges of disinformation and falsifying maps after criticizing the government’s handling of the Vietnamese border demarcation. Hun Sen's CPP wins a majority of votes in the national elections. Kem Sokha, who founded the human rights organization Cambodian Center for Human Rights in 2002, establishes the Human Rights Party (HRP). Cambodia holds its second commune elections. The CPP wins 98.2 percent of communes, while the SRP wins 1.7 percent. The royalist FUNCINPEC party ousts Prince Ranariddh as president following an accusation by Hun Sen that the prince was appointing unqualified individuals to political positions.Ranariddh was sentenced by the lower court to 18 months in prison and fined $150,000 for alleging breach of trust for buying land with $3.6 million taken from the sale of FUNCINPEC headquarters. Prince Ranariddh resigns as president of the National Assembly after Hun Sen fires then-Co-Minister of the Interior Norodom Sirivudh and Co-Minister of Defense Nhiek Bun Chay. Ranariddh flees to France. Rainsy returns to Cambodia after months of exile to avoid imprisonment on a defamation conviction over his criticism of the government’s border policy with Vietnam. He joins with the CPP to change the electoral law to require a simple majority rather than a two-thirds majority, leaving the royalist FUNCIPEC party less important in the coalition government. Hun Sen threatens to abolish Cambodia’s monarchy as King Sihamoni delays in signing a controversial border treaty with Vietnam, Cambodia's historic enemy. The king agrees to sign the treaty. Norodom Sihamoni succeeds his father King Norodom Sihanouk after a surprise abdication. Prime Minister Hun Sen and National Assembly Speaker Prince Norodom Ranariddh endorse Sihamoni. Hun Sen re-elected as prime minister. Cambodia holds its first-ever commune elections. The CPP wins a majority of seats on local administrative bodies known as commune councils, and thus appoints the majority of commune chiefs. Hun Sen and Ranariddh agree to form a coalition government, allowing Hun Sen to remain as the prime minister and Prince Ranariddh to become the president of the National Assembly. FUNCINPEC’s agreement with CPP left the SRP as the country’s main opposition party. Hun Sen's CPP wins a majority of seats in national elections, followed by FUNCINPEC and the SRP. Prince Ranariddh returns to Cambodia to run in the national elections. Troops aligned with the CPP and the FUNCINPEC clash in Phnom Penh after public arguments between Hun Sen and Prince Ranariddh become increasingly heated. The prince goes into exile and is ousted from his position a month later. Sam Rainsy founded the the opposition Khmer Nation Party (KNP). With King Norodom Sihanouk's intervention, FUNCINPEC and the CPP agree to form a coalition government, with Norodom Ranariddh as first prime minister and Hun Sen as second prime minister. Cambodia holds first post-Khmer Rouge-era presidential elections under the auspices of the U.N. Hun Sen’s Cambodia People's Party, a linear descendant of the Kampuchean People’s Revolutionary Party, which gave birth to the Khmer Rouge, loses to Norodom Ranariddh’s royalist FUNCINPEC. Nineteen nations sign the Paris Peace Accords, formally ending Cambodia's civil war. Vietnamese troops leave Cambodia after a decade of occupation. National Assembly appoints Hun Sen prime minister. A group of former Khmer Rouge soldiers, including Cambodia's future prime minister, Hun Sen, end the Khmer Rouge regime. Backed by the Vietnamese military, the group liberates Cambodia and Vietnam sponsors formation of a new Cambodian government. The China-backed Khmer Rouge occupy Phnom Penh. Over the next three years, eight months and 20 days, the regime will cause the deaths of at least 1.7 million people. U.S.-backed Gen.Lon Nol leads coup that topples Sihanouk. Sihanouk accepts role as head of state. King Sihanouk becomes prime minister after abdicating in favor of his father, Norodom Suramarit. King Norodom Sihanouk declares Cambodia’s independence from France. Since 1993, Cambodia has held a national election every five years. Cambodian people aged 18 and above are eligible to vote for any political parties they like. The party that wins the majority of votes then nominates its members to the National Assembly. Today, there are 123 National Assembly seats, 24 provinces and the capital Phnom Penh. The majority party in the National Assembly forms the national government, provincial governments, select the prime minister and various ministers. All nominations must be approved by the king. Since 1998, the ruling Cambodian People’s Party (CPP) has won each national election. As Cambodia stabilized and focused on institution building, it launched commune elections in 2002. Communes are the most local of administrative bodies, overseeing all the villages and their residents in a given area. Commune elections are held every five years, and the political party that wins the majority selects the commune chief in that commune. Commune chiefs work closely with the district governors addressing local issues such as sewage, roads, crimes, clean water, and electricity. The ruling Cambodian People’s Party (CPP) has occupied most of the commune seats nationwide since 2002. Over the past two decades, at least two million Cambodian households in every one of Cambodia’s 22 provinces has obtained very small loans from microfinance institutions (MFIs) that provide cash to farmers, fishermen and others who need money to sustain their livelihood. Without access to the MFIs, these Cambodians would have no access to credit. Microloans are not unique to Cambodia. Muhammad Yunus started the Grameen Bank in Bangladesh, loaning very small amounts of money to very poor women who needed to buy materials to produce the goods that they made and sold. He charged very low interest rates and the borrowers repaid in full at record rates. For example, in 2016 the microfinancing institution Opportunity International reported repayment rates of approximately 98.9 percent. Yunus and the bank won the 2006 Nobel Peace Prize for developing microfinance and “their efforts to create economic and social development from below.” The International Finance Corporation (IFC), which is part of the World Bank Group, estimated that, as of 2014, more than 130 million people have directly benefited from microfinance-related operations. 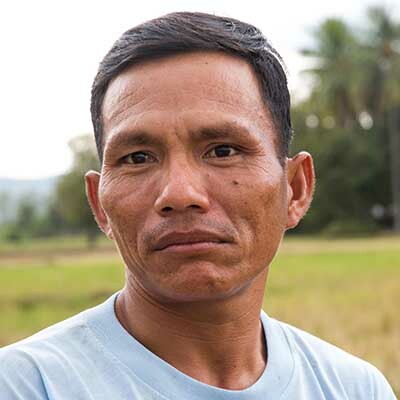 In Cambodia, many of the MFIs are for-profit—although most Cambodians believe MFIs are government-run—and many borrowers are finding it punishing to pay back, for example, a $1,000 loan with a 3.5 percent monthly interest rate. It is particularly difficult for farmers whose profits are dictated by world commodity prices. At the end of 2016, Cambodians collectively owed $3.1 billion to MFIs, according to a World Bank report, and 88 percent of borrowers live in impoverished rural areas. A 2017 “special circular” report prepared for the Cambodian Microfinance Association by the Mimosa Project – which studies microfinance over-indebtedness in developing countries – found “that the size of the loans granted by MFIs in the decade from 2004 to 2014 had grown at a rate four times the rate of the growth of incomes of the debtors receiving loans, a phenomenon it described as dangerous and unique to Cambodia,” the Phnom Penh Post reported. Some small relief arrived in April 2017, when the government capped the allowable annual interest rate at 18 percent. But that locked-out those borrowing the smallest amounts, because MFIs found small loans ate up profits with administrative costs. Originally established as the Marxist-Leninist Kampuchean People’s Revolutionary Party on June 28, 1951, the reformist Cambodian People’s Party (CPP) has ruled Cambodia since the Khmer Rouge regime fell in January 1979. The CPP entered the first elections sponsored by the United Nations Transitional Authority in Cambodia (UNTAC) in 1993, but lost to FUNCINPEC, the royalist party. With King Norodom Sihanouk’s intervention, FUNCINPEC and the CPP agreed to form a coalition government in 1993, and Hun Sen became the co-prime minister. Hun Sen became the president of the CPP in June 2015. The Cambodia National Rescue Party (CNRP) was founded on July 17, 2012 when Kem Sokha’s Human Rights Party (HRP) and Sam Rainsy’s Sam Rainsy Party (SRP) merged. Sam Rainsy, a former finance minister who founded an opposition party in 1995, was president and Kem Sokha, long a voice for political rights, as well as social and economic development, at village level, was the vice president. The CNRP entered its first elections in 2013, and won 55 seats of the 123 places in the National Assembly. In March 2017, Kem Sokha succeeded Sam Rainsy as the CNRP president. On September 3, 2017, Kem Sokha was arrested at his home in Phnom Penh for alleged treason, accused by the government of conspiring with the United States to bring down the Cambodian government. On November 16, 2017, Cambodia’s Supreme Court ordered the dissolution of the CNRP. Some opposition members joined the CPP, while many fled the country or were forced out of politics. National United Front for an Independent, Neutral, Peaceful and Cooperative Cambodia (FUNCINPEC) was founded in 1981 by Prince Norodom Sihanouk as a movement against the Vietnam-backed People’s Republic of Kampuchea government. In 1991, Prince Norodom Sihanouk handed over the movement to Prince Norodom Ranariddh. FUNCINPEC, an acronym from the party’s name in French, the language of Cambodia’s European colonizers from 1863 to 1953, became a political party in 1992. FUNCINPEC participated in the national election sponsored by the United Nations Transitional Authority in Cambodia (UNTAC) in 1993. The party won the election, but Prime Minister Hun Sen refused to step down. With King Norodom Sihanouk’s intervention, Prince Norodom Ranariddh and Hun Sen agreed to form a coalition government, becoming co-prime ministers until 1997 when their personal animus erupted into July 1997 street fighting between armed forces loyal to Hun Sen and Prince Ranariddh. Hun Sen’s forces won and the prince went into exile. Human Rights Party (HRP) was founded on July 22, 2007 by Kem Sokha. The party entered its first Cambodian national elections in 2008, and won three seats out of 123 in the National Assembly. Sam Rainsy Party (SRP) was originally founded in 1995 as the Khmer Nation Party by Sam Rainsy. The SRP won 15 seats in the National Assembly in Cambodia’s 1998 national elections. In the 2003 elections, the SRP won 22% of the votes, becoming the second-most popular party in the country after Hun Sen’s CPP. The Khmer Rouge also known as the Kampuchean People’s Revolutionary Party took control of Cambodia on April 17, 1975. Under Pol Pot, they adopted a radical Maoist and Marxist-Leninist ideologies and wanted to transform Cambodia into a self-sufficient agrarian, classless society. The regime targeted professionals, intellectuals including teachers, Buddhist monks, anyone suspected of having ties to the former Cambodian government or foreign governments, and ethnic minorities. The regime forced people to move out of the cities to rural provinces where forced labor, malnutrition, disease, and mass executions killed approximately 1.7 million people or a quarter of the country’s population by the time the Vietnamese invasion toppled the Khmer Rouge on January 7, 1979. A VOA Khmer Service team spent six months talking with Cambodians during the run-up to the nation’s sixth national vote for 125 members of the National Assembly on July 29, 2018. The team traveled to six provinces and Phnom Penh, the capital city, and focused on rural residents because they are the majority of Cambodia’s voters. Many spoke of how they feel left behind by their nation’s economic expansion, which is upending their traditional way of life as they are buffeted by national and global forces.